Again I am in a soft-edged interior world. When I considered the photograph and the day it was made, bland clarity was not what I wanted. I like the image better this way, as if someone might find the photo at the back of an old bureau drawer and wonder a moment about who made it. 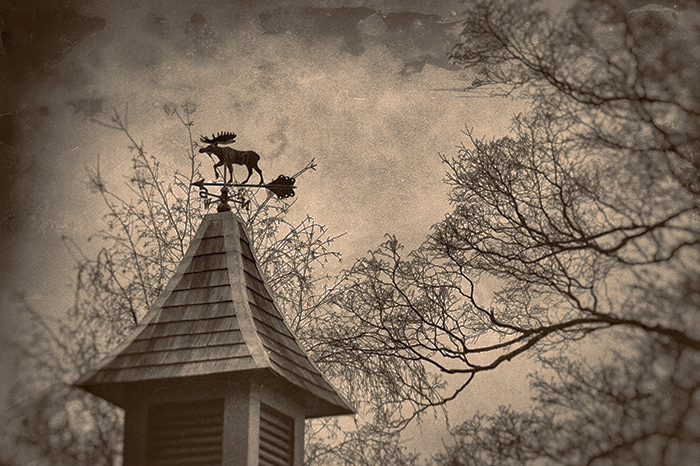 This entry was posted in Altered States and tagged Barns, Black-and-white photography, Farms, Weather Vanes. Bookmark the permalink. I really love this image, it has all the elements of a classical study. Bravo!!!! I like this! More and more often I have been finding myself developing my images to appear as they might have been, or may one day be.